I must confess that I am intrigued by old things of a bygone era, be that a classic car, an old fountain pen, a motorcycle with sidecar, a Thirties wireless radio, a Wurlitzer jukebox, an old-fashioned printing press, you name it. Saying that, you’ll be surprised when I tell you that you’ll find none of these in our house, except perhaps for a fountain pen from the Seventies. 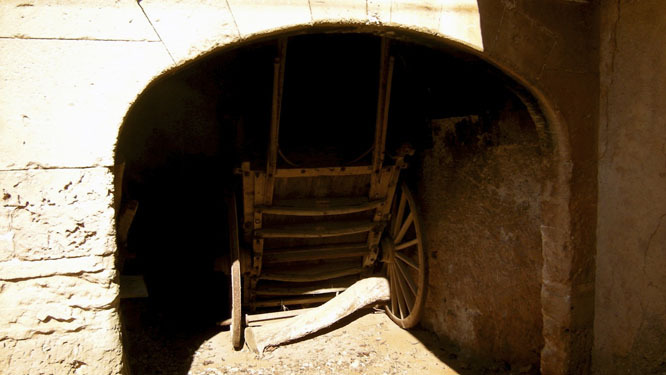 Here in Mallorca, my heartbeat goes up every time I see an old farming instrument, a plough perhaps or an old wine barrel, a horse cart like the one shown in the picture or a loom of yesteryear. You may call me old-fashioned, sentimental, a romantic even, but, there you are. Even more than the old objects I admire people such as some of my friends here on the island who lovingly restore and cherish such old treasures. One friend collects and lovingly reconditions old motorbikes, another proudly stores and restores vintage cars, yet another overhauled his old horse cart with great care and dedication and has just laid his eyes and his heart on yet another, slightly bigger carriage, as old and equally beautiful..
Talking about the cart in my photograph, I have you know that you won’t be able to take this vehicle on any public road in Spain, not even here in Mallorca. There is a law prohibiting old spoked wheel carts, wooden or otherwise, careering up and down public roads as long as their wheels are rimmed with an iron band. Should you want to cruise with such an old cart, you would first have to refit the vehicle with modern type, rubber-tyred wheels. Of course it can be done but, it will not quite be the same. The photo was chosen from my archive. It was taken near Felanitx, Mallorca, Baleares, Spain. The date: February 6th, 2011. The time was 12:52:58.